Manual gates often remain left open, allowing you and your visitors to come and go without having to shut them. If you have a set of existing gates that you would like to automate there is every chance that I will be able to accommodate you and will be able to asses if your gates need any adjustments or if they’re ready to automate immediately. Should the gate pairs are in sound condition; parallel and undamaged your gates should be suitable to have retrofitted automation. Otherwise repairs can be undertaken; once again I will be able to advise you on all aspects of automating existing gates. Most users will have a system similar to this. The system consists of; A pair of gates, A pair of gate operators, a control panel with electronics for operating the gates, a couple of remote controls and an intercom or numeric keypad plus a pair of photoelectric cells for safety. The gates will usually be operated with a ‘single hit’ option, whereby the gates open when you press the remote control and close automatically after a short preset delay allowing you time to proceed through the entrance. The Agriwheel is no longer manufactured but we are still able to source the majority of spare parts and have other options available to repair and maintain existing installations. 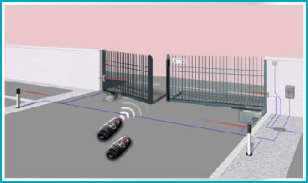 The underground automation system can be fitted to new gateways and some existing gates that you may have. Electromechanical swing gates mains or Solar powered..